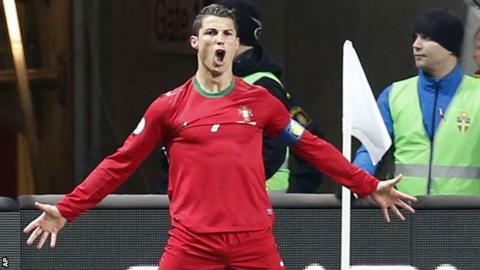 Cristiano Ronaldo produced the latest in a series of stunning performances as he won his personal duel with Sweden's Zlatan Ibrahimovic to help Portugal reach the 2014 World Cup. The Real Madrid forward, 28, scored his fifth hat-trick of the season in the play-off second leg as Portugal won 3-2 in Solna - despite Ibrahimovic's double - to secure a 4-2 aggregate victory. Ronaldo also struck the only goal in the first leg, with those four efforts in the tie prompting a host of former and current players to suggest the ex-Manchester United forward should win this year's Ballon d'Or, which is awarded to the best player in the world. His latest performance could help his chances of winning the award because Fifa, world football's governing body, extended the voting period from 15 November to 29 November after receiving a response of less that 50% from eligible voters before the original deadline. BBC Sport takes a look at some of the reaction to Ronaldo's display, as well as considering some of the statistics from an increasingly impressive campaign. Former England defender Rio Ferdinand: @Cristiano is at it again. The Ballon d'Or has to be handed over now!" Former England striker Gary Lineker: "I don't care how many trophies Ribery has won, the best player is the best player. And this year that is undisputedly Cristiano Ronaldo." Fifa president Sepp Blatter: "Parabens Portugal! The 29th team confirmed for the World Cup; their sixth finals. Fantastic performance by Ronaldo." Former England and Everton midfielder Phil Neville: "Best player in the world #fact." Former Bolton midfielder Fabrice Muamba: "Ronaldo deserves to win Ballon d'Or hands down!" "Cristiano Ronaldo is the best player in the world," said Hull and Egypt's Ahmed Elmohamady. "I know Portugal needed me in these matches and I showed I am here. I just did my work as I have been doing lately. "To be honest I think in both games we played better than Sweden. "I respect Sweden a lot, I think they have a fantastic team, they have experienced players, they have a good coach, but in both games we played better than them, we created more chances, we played solid. Ronaldo's hat-trick drew him level with Pauleta as Portugal's joint-top scorer on 47 goals. He added: "This is a beautiful day for me personally and for my country. "I scored three goals, equalling Pauleta's performance, this makes me happy, we must enjoy this moment." The same word appears with striking regularity in the Portuguese headlines as they describe Cristiano Ronaldo's decisive impact on the World Cup play-off against Sweden last night. The word is 'leva', Portuguese for 'leads'. The Portuguese captain has previously been accused of failing to replicate his Real Madrid form for his country, but such doubts seem to have been dispelled after last night's hat-trick saw him equal Pauleta's record of 47 goals for Portugal. Diario de Noticas said: "Cristiano Ronaldo showed that the captain's armband is no longer a prop, but something that is well deserved." It adds that it is now impossible to argue that his performances for the national team do not match those for his club. The front page of this morning's Correio De Manha declares him "the new king". Publico calls him "the superhero who found a way to the world". It added: "Prayers for the Portuguese national team may be addressed to any one deity, but it is the superhero Cristiano Ronaldo who responds." In the 2004 FA Cup final as a 19-year-old, Ronaldo scored Manchester United's opening goal and starred in a 3-0 win over Millwall as he won his first trophy in English football. The Portuguese scored a penalty for Manchester United in a 1-0 win over Manchester City in the penultimate game of the 2006-07 Premier League season as he helped the Old Trafford club claim the top-flight title. In the 2008 Champions League final, the winger put United ahead against Chelsea in Moscow. The Blues equalised and, despite Ronaldo missing his attempt in the penalty shoot-out, United still won the European crown. Ronaldo scored a spectacular 40-yard effort against Porto to help United reach the Champions League semi-finals in 2009, in which he scored twice and starred in a 3-1 second leg win over Arsenal. In the 2011 Copa del Rey final, Ronaldo scored Real Madrid's extra-time winner against fierce rivals Barcelona to claim the Spanish trophy for the Bernabeu side. He also scored the winner against Barcelona in a 2-1 league victory in April 2012. Ronaldo produced the winner against Sweden in a World Cup play-off first leg before a hat-trick in the return leg secured his country's place at Brazil 2014. Ronaldo has scored eight goals in the Champions League this season, more than all but eight of the 32 teams involved. He has scored four hat-tricks in league football in 2013, twice as many as any other player in the top five European leagues. Three of those hat-tricks have come in his last six appearances (all comps for Real Madrid and Portugal). He has scored at least once in 16 of his last 19 appearances (all comps for Real Madrid and Portugal). Only nine of the 20 La Liga teams have scored more goals than him this season (16). Ronaldo, 28, has scored or assisted 19 of Madrid's 35 league goals this season (54%). He is the only player to score two hat-tricks in this World Cup qualifying campaign. He is now level with Pauleta as Portugal's leading scorer with 47.